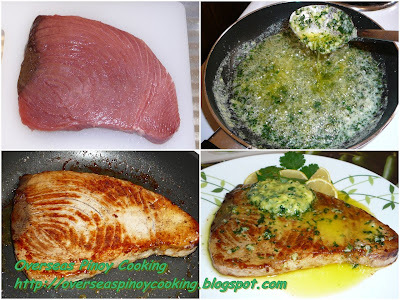 Tuna Steak with Butter Garlic and Parsley Sauce. This time of the year Catholic Christian are celebrating the Lenten Season. Traditionally Pinoy’s celebrate The Holy Week with abstinence of meat specifically on the Good Friday. There are a number of fish and sea food dishes on the archive should you are looking for something to cook this Holy Week. Today I am posting a special fish dish that I have prepared the other day. I was at the fish market and I just couldn’t resist those fresh full sized tuna steak. I just pan grill the tuna steak with a non steak pan. It would have been better if I had a griller. Tuna are supposed to be cooked quickly, overcooking it will render it hard and dry. So it is best to just quickly sear the tuna they are fresh any way. Here is how I cooked it. 1 kilo tuna steak, about 3 slices. In a pan stir-fry garlic until fragrant. Add in parsley and stir cook for another minute. Now place the butter in the pan and allow to melt in moderate heat stirring occasionally. Pour the melted sauce in a plastic container and place in the freezer to allow the sauce to solidify. Rub salt and pepper on the tuna slices and drizzle with lemon juice let stand to marinate for at least 15 minutes. In a nonstick pan melt 1 tbsp butter and pan grill the tuna slices one by one for 2 to 3 minutes each side at moderate heat. Place in a serving platter. Top with a scoop of semi solidified butter garlic and parsley sauce over the tuna steak and serve.